"That's comfort food for me. 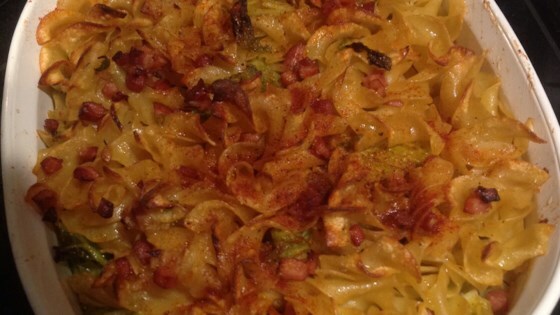 I think it's very similar to the Hungarian cabbage and noodles." Place shredded cabbage in a bowl; sprinkle with salt and toss to combine. Allow cabbage to stand for 30 minutes; squeeze cabbage dry and discard juice. Heat vegetable oil in a skillet over medium heat. Cook and stir cabbage and onion until cabbage is lightly browned, 10 to 15 minutes. Season to taste with salt and black pepper. Lightly mix egg noodles into the cabbage mixture; season with salt and black pepper if needed and sprinkle with caraway seeds. Not bad. Nice way to use some cabbage. I added some butter at the end. I tweaked the recipe by adding finely diced ham and used Sweet Hungarian Paprika instead of caraway seed. This dish was so savory it could almost stand alone as an entree. Very good. I also cooked some ground beef and mixed that in as a variation on this dish. I love bacon or sausage in this. Im not a huge caraway seed fan though.